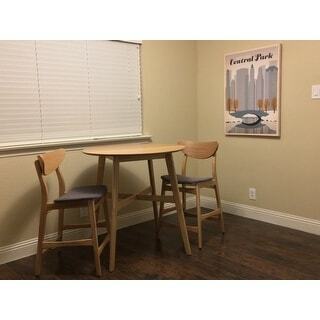 Such a cute dining table for my small apartment! It came in two packages about two days apart but the quality of it is great. 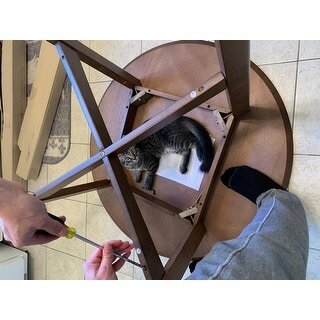 Assembly went a lot quicker than expected, some parts you would have to screw in your own holes for but other than that everything went smoothly. I couldn’t be any more happier about how amazing it looks. 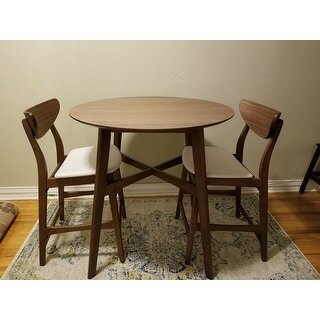 I would recommend it if you are looking for a small dining/breakfast table for a small apartment. 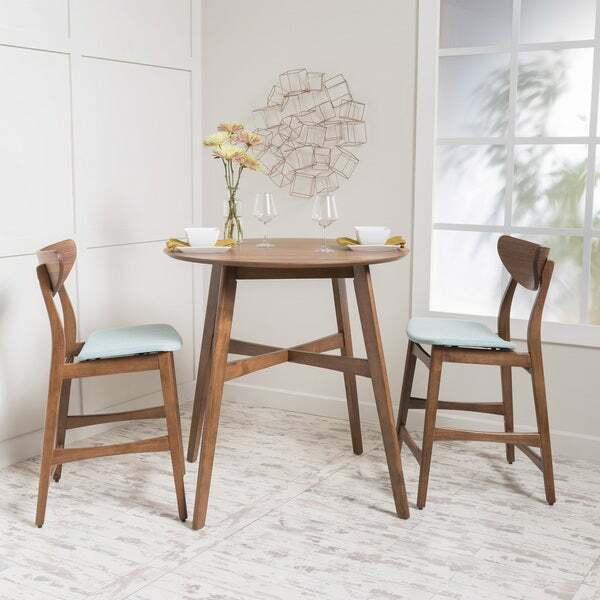 Perfect for a breakfast nook, this elegant dining set offers an ideal space for intimate dinners or casual chats with coffee. Sleek lines offer an elegant mid-century modern profile, and the set is available with a range of upholstery and finish options to perfectly match your decor. Assembly Required.This product will ship to you in multiple boxes. Easy to put together, nice height, looks high quality. The fabric on the seats is nice and does not stain easily. the finish on the table is smooth. it fits perfectly in my breakfast room. 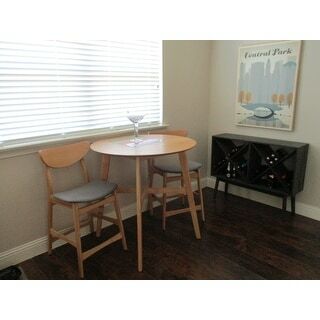 The table looks great and works perfectly for my small space. It’s the perfect size for a small apartment and for two simple place settings. The actual table itself took about 15 minutes to assemble, but the chairs were a little more complicated. They also arrived separately (first chairs, then table) so that’s a minor inconvenience. Chairs feel sturdy, and the color was true to the online image. Table is less study feeling, but no issues yet. All in all, very satisfied with this purchase. Really like this set. Great grain finish on the table-top, and overall it's really appealing - even in my small kitchen. There would be an "intimate" dinner for four with additional chairs added, better suited perhaps for a couple allowing room to move. Assembly was very easy - the whole set taking little more than 90 minutes single handed, and the tools needed were quite basic. Easy to keep cleaned, I rarely cover the table because I like the grain so much, and only a light wipe-down with a light cleaner required. Must admit that it sits tall, as do the chairs, but perfect for my house/kitchen. Easy to put together, from what we can tell the chair is all wood, but not heavy, legs have adjustable screw pads. Chair seats are very thinly padded but has a comfy curve, it's wider than it is deep. The table surface feels like veneer and legs are wood, table is around 30lbs. The finished product looks modern and is solid and smooth. Made in Malaysia. We're very happy with the purchase, might look into getting two more chairs. Love this set! Took about 2 hours to put together - given that the instructions weren't too clear on certain areas (labels were missing off pieces). However, this set is sturdy and it has a gorgeous finish. 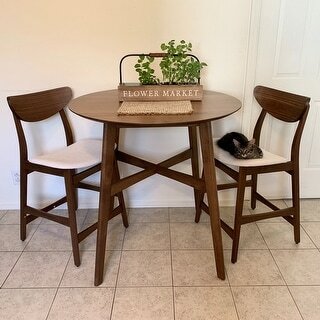 I finally got to set up my Dining set. It looks beautiful in my eat in kitchen. Very good quality wood. The chairs are comfortable and sturdy but the fabric on the chairs are not cushy at all but it's still comfortable. This product is well made and met my expectations. It was just as described online. I like to buy from Overstock for the convenience and ease of getting items delivered directly to my door. This piece is great and perfect for a studio apartment. It is closer to bar height than counter height. It takes a decent amount of time to put together, but straight forward enough one adult can do it. Another great furniture. Just know that the height is like a bar stool. I thought it’ll be shorter like a coffee table. My fault for not measuring. It turned out awesome though. Perfect set for small area. 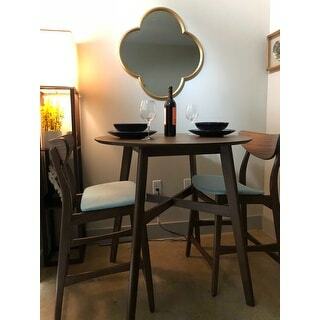 Purchased for daughters college apartment with eat in kitchen area and no dining room. It worked perfectly in the small space! Two young women were able to put it together easily as well as move it around. Quality is perfect for college living. Cheap!!!! Not worth the money. I love this little set. Not strong enough for heavy use. Really lovely set. We bought three of them for our employee lounge. They look great and everyone loves hanging out during lunch with the higher tables. Very sturdy! "what is distance between seat and rung for feet?" I bought this someone else and don"t have an exact measurement, however I'm 5'5" and when I sat on chairs my feet rested comfortably on the rung. "are tools for assembly included?" "Do the chairs push in under the table?" Unfortunately, the chairs cannot be pushed under the table. "How should the table top be cleaned?" I've only been using a slightly moist paper towel, with basic soap and water. 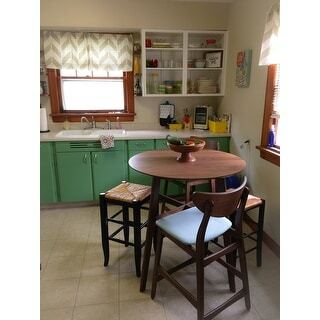 Like the look and I want s counter-height set..been looking for quite awhile and now I found it! Love the green seats! They will match my rug i ordered from you last week perfectly! "From the top of the chair to the top of the table it is 12" - right? Is it a comfortable height?" 12" is correct. Different sized family members tested it - and it's still about 5-7 inches worth of space from our lap to the bottom edge of the table. "How high is the seat of the chair?"